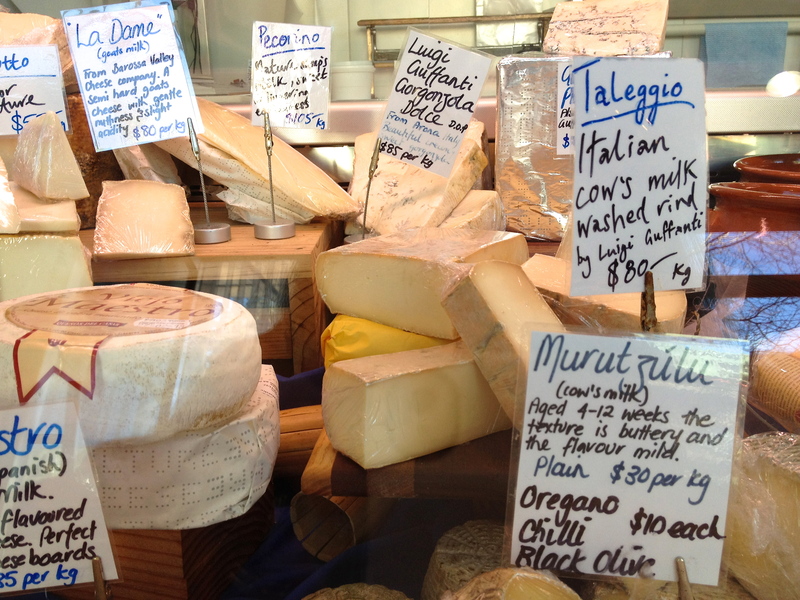 La Latteria literally means “the dairy” and it is also a fantastic cheese shop in Carlton in inner city Melbourne. When you walk into the shop, it smells just like a dairy – like cheese is actually being made at the back of the shop. They have an amazing array of fresh cheeses, many hand made by La Latteria or by other local producers and some selected imported cheeses, predominantly italian. I did a cheese making class late last year with Giorgio who runs La Latteria. He showed us how to make a whole range of cheeses including ricotta, primo sale, mozzarella and burrata. It was an enormous amount of fun stirring milk and starter culture in huge pots. Together with other enthusiastic cheese makers, I watched on as Giorgio demonstrated cheese stretching and shaping techniques by making plaits, knots and even mozzarella balls stuffed with olives. 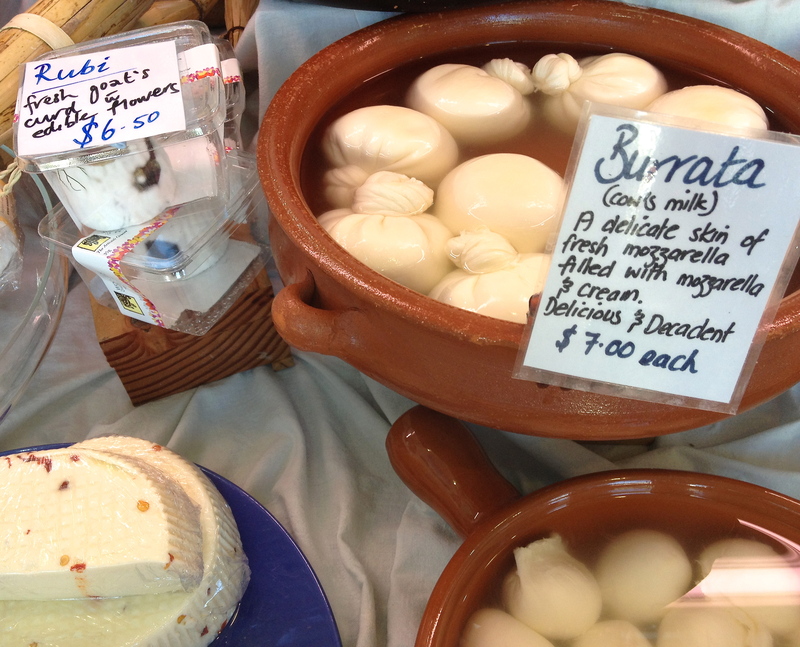 The most impressive of the cheeses that I made and took home was the burrata, which is a decadent soft ball of mozzarella stretched and filled with cream and strands of mozzarella. When you open it, the cream oozes out. It is seriously amazing. My favorite way to have burrata is in a salad by Tilly Devine. The burrata takes centre stage amongst a spicy mix of olives, broad beans and mint, which have been marinated. When the cheese is cut open, creamy mozzarella oozes out, mixing with the marinade and making the most delightful sauce to mop up with crusty bread. It is creamy but fresh – full of flavor and bursting of spring. It is also a visual treat with bright green beans, darker green mint leaves, black olives and creamy white cheese. You need a bit of preparation time – the broad beans are double podded so allow an hour for this (I usually do it several hours before hand, whilst watching tv or being otherwise occupied!). This entree is delightful with a glass of italian pinot grigio. Blanch the single podded broad beans in boiling water for 2 to 3 minutes and refresh in iced water. It should now be easy to remove the skin from each bean. Once double podded, wash them well. Combine with the mint leaves and the remaining olive oil. Allow the flavors to infuse for an hour. Place the olives in a small ceramic bowl with the chilli flakes, one third of the olive oil and the vinegar. Mix well and allow to rest for an hour. When you are ready to serve, combine the olives and the broad beans. Add salt and pepper to taste. Arrange on a serving dish, making a well in the center, in which you will place the burrata. Serve with lemon wedges and plenty of crusty bread to mop up the marinade and the cream from the burrata. Wow! This looks amazing! I’ve been eying up this cheese in my cheese making book, but I’d love to try the real deal before I have a go at making it! It’s definitely one to work up to! I would have liked to see a pic with the cream oozing out of the burrata.